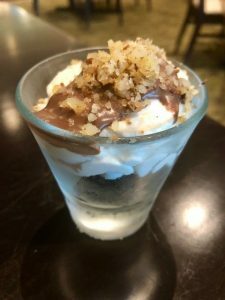 It was this time last year that I wrote about Harvest Seasonal Grill and their opening in Delray the previous Fall. 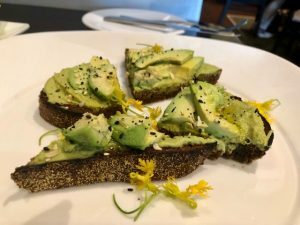 Since then, I’ve been back numerous times to enjoy the creative seasonally-inspired dishes of Executive Chef Bill Ring. I was invited to dine as a guest of The Gab Group, the PR firm representing Harvest. I brought along my long time foodie friend and newcomer to the blogging scene Patrice from @ForkAndACork. We started off with our choice of cocktails. 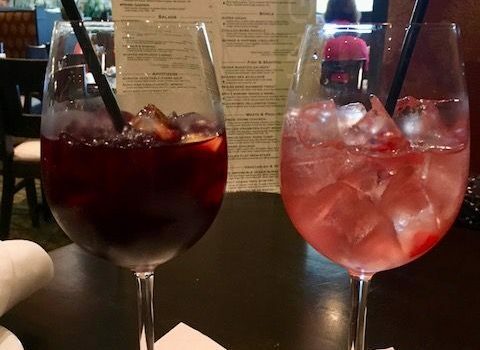 When I saw the rosé sangria was back on the menu, I immediately chose that for my selection. I’m not ordinarily a fan of rosé, but when Reba, Harvest’s Marketing & Events Manager, first introduced this Rosé Strawberry Rhubarb Sangria last year, it was love at first sip. The key is to make sure that the glass has lots of ice and is served super chill too! Patrice enjoyed her Red Mango Apricot Sangria very much as well. 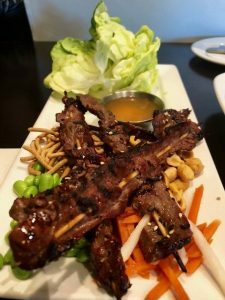 Next, we decided on a couple apps: the Thai sesame beef lettuce wraps and the sweet pea & avocado toast. The Thai beef wraps were the star of the two for me. 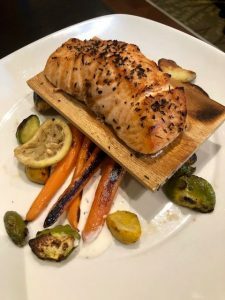 For the entrées, we tried the cedar roasted salmon which was seasoned and cooked to perfection! We both really loved this dish and I also really enjoyed how Chef Bill prepared the side of veggies (squash, zucchini & carrots). 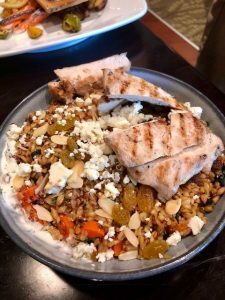 The second entrée was not necessarily a new dish, but the Super Grain Bowl is now being presented in a new fashion and can be found under the “bowls” section. We chose chicken as our protein but you can select the protein of your choice. The dish, in our opinion, was a little dry and needed some more of the sauce that it came with. Once our server brought us over some more and we were able to incorporate it into each bite, it was quite yummy. The signature tray of mini desserts was brought our way to tempt us. 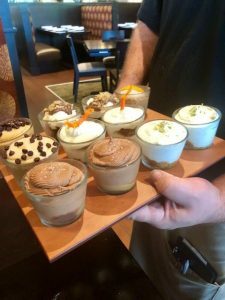 There were so many wonderful varieties to choose from and we chose the chocolate salted caramel mousse and the walnut fudge brownie. Both were soooooo good!!!! 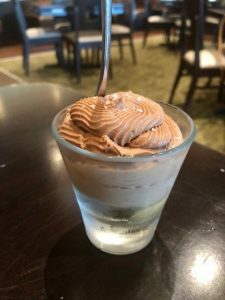 Be sure to check out my previous write up on Harvest Seasonal Grill to get a little more info on the restaurant. Harvest Seasonal Grill is located in the Delray Place shopping plaza at 1841 S. Federal Highway, #402, Delray Beach, FL 33483. For more information or to make a reservation, call (561) 266-3239 or visit www.harvestseasonalgrill.com.